The members of Orquesta Akokán hail from both Cuba and the U.S., assembled by vocalist and composer José "Pepito" Gómez. They recorded their debut album live to tape in just three days. Orquesta Akokán takes its name from the Yoruba word meaning "from the heart." The group's self-titled debut album, released in March, draws deep from the soul and history of Cuba, reviving the spirit of the big-band orquestas of decades past like Buena Vista Social Club and Orquesta Aragón. The 16-piece ensemble recorded in Havana's famous Areito Studio 101 at the state-run EGREM recording complex, where legends like Celia Cruz, Benny Moré and Frank Sinatra recorded since the 1940s. Orquesta Akokán sounds like it could have been recorded that long ago. 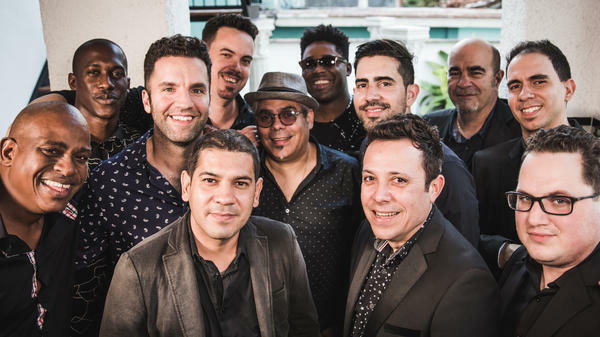 "That was our intention," says New York producer Jacob Plasse, a lifelong fan of mambo greats like Moré and Pérez Prado, who teamed up with vocalist José "Pepito" Gómez to recreate Cuba's most iconic sounds on the album. They originally tried to record in New York, but Plasse says it just wasn't the same. "There's a certain culture of rehearsing and practicing that exists in Cuba, that's hard to find in New York," he says. "Cuban bands rehearse four or five times a week for four or five hours a day. That lent a power to [it]; when you have four saxophones playing together, they would sing the parts back and forth to each other and it really made the music come alive." Born in 1972, Gómez wasn't alive when Cuban mambo was at its peak in the 1950s. "My generation did not have the opportunity to get to really know [this music], so I discovered it here in New York," he says, speaking to NPR through a translator. "I gave myself the task of studying all the music from that era: the orchestras that were playing at that time, the singers, the way the melodies moved, how to set the words to this music." When he was in Cuba, Gómez wrote popular songs for bands like Pupy y Los que Son, Son, but he says writing a song for an orquesta was a new challenge. "I was a successful composer, but writing this kind of song was way more difficult. They just used to compose songs in a different way." Gómez wrote the lyrics and melodies, while Plasse and pianist and arranger Mike Eckroth (who wrote his PhD thesis on Cuban piano solos of the 1940s) arranged the music. Gómez vouches for their authenticity, recounting the reactions of several Cuban musicians who were curious about the arrangements. "They were saying, 'Who is it? Was it someone from here in Cuba?' And I pointed to the man sitting at the piano," he says of Eckroth. "They said, 'What? That little white dude?' And I said, 'The very same.' "
Recording the album in Havana was not without its challenges: Plasse recalls rolling blackouts at the studio and having trouble finding paper to print the music on. Despite those obstacles, he says just being among "the ghosts ... there with you" in Areito Studio 101 was worth it. While the American musicians had to cut through plenty of red tape to travel to Cuba to record, Plasse says it is much more possible to have this kind of cultural exchange after President Obama's 2014 announcement of a normalization of relations between the countries. Those policies have since been rolled back, and with Raúl Castro's imminent retirement and Fidel Castro's 2016 death, the island faces an uncertain future with the United States. "It was such an incredible learning experience for me and Mike to go down there and spend time with these musicians who are repositories of knowledge and culture," Plasse says, "that one can only hope that this can continue." Gómez agrees: "I think this has set a precedent and has been very important for the culture," he says. "Because this record, apart from being simply good music, also serves as a bridge between the two cultures." The band Orquesta Akokan takes its name from the Yoruba word Cubans use that means from the heart. And this music from their self-titled debut album definitely comes from deep in the soul and the history of the country. The 16-piece group recorded in Havana's famous Areito Studios, where Cuban stars have recorded since the 1940s. Producer Jacob Plasse joins us from our New York bureau. Welcome. JACOB PLASSE: Pleasure to be here. GARCIA-NAVARRO: And lead singer, Jose "Pepito" Gomez, is also with you. Welcome. GARCIA-NAVARRO: So, Jacob, tell me about this music. I mean, it sounds like you're taking us back to a different era. It's, you know, the 1950s in Cuba, almost. PLASSE: Yeah, well, I'm glad you say that because that was our intention. I've been a fan of mambo music for a little while now. And Benny More and Perez Prado are really big influences on my music. And as I've learned more, it's become apparent how deep the style is. I just really love it and was trying to figure out a way to go down there and record this type of band. GARCIA-NAVARRO: Pepito, you were born in 1972, well after this kind of music was popular. And it's such a retro sound. How did you channel it? You sound like you've been singing it all your life. GOMEZ: (Through interpreter) To make this record, play this music, it took a lot of study. My generation, we didn't have the opportunity to grow up with this music, to get to really know it. I discovered it as an adult here in New York, and I took on the task to study all the music from that era and the orchestras that were playing at that time on the hit parade - the singers, the way the melodies moved, how to set the words to this music - and all that homework paid off. I got to know the music. I absorbed the style of those earlier years. ORQUESTA AKOKAN: (Singing in Spanish). GOMEZ: (Through interpreter) This kind of music was - or I should say is - in the very foundation of Cuban culture. And I should say that I wrote the lyrics and the melodies, but it was Mike Eckroth and Jacob who provided me with the arrangements. This whole way of composing music - that was new to me. I had always just written songs on my own. GARCIA-NAVARRO: So it was a collaboration? GOMEZ: (Through interpreter) Yeah, exactly - between the three of us. GARCIA-NAVARRO: So let's listen to another track from the album. This is "Yo Soy Para Ti". GARCIA-NAVARRO: Jacob, let's talk about Cuba. You tried to record this album in New York, and it didn't work. It kind of fell flat. PLASSE: Yeah. There's a certain culture of rehearsing and practicing that exists in Cuba that's hard to find in New York. Cuban bands rehearse four or five times a week for four or five hours a day. And so they're used to rehearsing, and that lent a power to when you have four saxophones playing together. Like, they would sing the parts back and forth to each other, and it really made the music come alive. It was a pleasure to watch. GARCIA-NAVARRO: So, as you say, you took it to Havana and the famous Areito Studios. NPR's Felix Contreras wrote about the studio. And he said, quote, "Every Cuban artist of note has performed in studio ciento uno. And before the revolution, many Americans also walked into its wood-paneled walls - from Benny More to Celia Cruz to Frank Sinatra." That's quite a history. PLASSE: Yeah and you feel it as soon as you walk in, that there's something special about the space. The ghosts are there with you. So it was definitely incredibly inspiring to be there and, to be honest, a little intimidating. But the band was so great, and the music just came together. And, you know, it's not easy going down to record in Cuba. There are significant challenges. But, you know, when we walked in that room, it was clear that it was totally worth it. GARCIA-NAVARRO: Pepito, I heard there's a story about Mike Eckroth, who's the pianist and arranger on this album, who has a Ph.D. and did his thesis on Cuban piano solos of the 1940s. GOMEZ: (Through interpreter) When we finished recording, some of the Cuban musicians came up and asked, who did the arrangements? They'd clearly been done by someone who understood, really understood Cuban music. And they were asking, who is it? Was it from someone here in Cuba? And I pointed to the man sitting at the piano. And they said, what? That small, little white dude? And I said, the very same. They were really surprised that Mike was the arranger, that he knew Cuban music and that style of music as well as he does. GARCIA-NAVARRO: All right. Let's listen to a track where we get to hear some pretty amazing vocal calisthenics from Pepito. This is "Mambo Rapidito". GARCIA-NAVARRO: I wanted to ask you about the scene in Cuba today. You know, we had a brief opening with the United States politically. That's now been rolled back. The end of the Castro era is imminent with Raul Castro retiring this year. What do you think these collaborations do for understanding between the United States and Cuba? GOMEZ: (Through interpreter) I think this has set a precedent. This is very important because this record, aside from being just really good music, well, it serves as a bridge between the two cultures. GARCIA-NAVARRO: I guess the question is, are these collaborations easy for you - are they easier or harder than they were in the past? I mean, we've seen collaborations between American and Cuban musicians, but this is a different era. PLASSE: Yeah, I mean, I think it's much easier than it was pre-Obama to go there and do these things, but, you know, you run into a lot of difficulties, like the studio has rolling blackouts and it's hard to find things like paper and be able to print music. But it's definitely more possible now than it was in the past. And I think it's a really wonderful time right now to go to Cuba and experience the music and the culture. GARCIA-NAVARRO: From Orquesta Akokan, that's Jacob Plasse and Jose "Pepito" Gomez. Thank you very much. (SOUNDBITE OF ORQUESTA AKOKAN SONG, "NO TE HAGAS") Transcript provided by NPR, Copyright NPR.